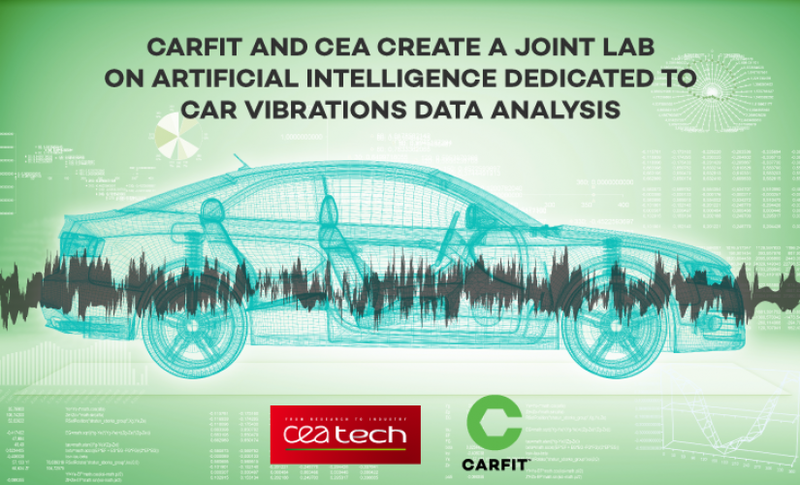 CARFIT and CEA have signed an agreement to create a joint laboratory focused on Artificial Intelligence related to car vibrations and their interpretation. The lab will bring together teams from the List, a CEA Tech Institute, and from CARFIT to share knowledge and expertise. The joint lab will be dedicated to the development of artificial intelligence methods for identifying signs of mechanical failures exposed by car vibrations. CARFIT develops technological solutions to simplify mobility, by proposing real-time car monitoring to offer a smart maintenance system, adapted to the driver’s car use. The CARFIT team is comprised of automobile specialists, scientists, and artificial intelligence experts. CARFIT wants to further develop its predictive maintenance expertise by exploiting automobile vibration data analysis. The activities of CARFIT and CEA are thus complementary, enabling a fruitful collaboration on automobile predictive maintenance by vibration analysis. The two partners have therefore agreed to conduct a common R&D, leading to the design and development of optimized, innovative solutions of predictive maintenance for light-duty vehicles (authorized loaded weight not to exceed 3.5 tons). Disclaimer: CARFIT is an alumnus of our ReadWrite Labs accelerator program. Kyle Ellicott is also an advisor to the company.